What costs more to run for a year, your car or your horse? NEIL CLARKSON investigates. They both have four on the floor, flowing lines, and churn out plenty of horsepower. 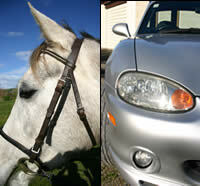 You may be surprised just how much your fine equine companions share with a gleaming sports car. Should we be surprised? After all, the humble motor vehicle was only ever intended as a replacement for the horse, and for many years it didn't do a particularly good job of it. Both require fuel, repair and careful maintenance. Play your cards right, and both will reward you with many years of faithful service. But every finely tuned performer, be it a horse or a sports car, will have ongoing running costs. Which do you think is dearer to run for a year? The question, of course, is difficult to answer. A new car will depreciate more, but will have very low maintenance costs. An older car will fare better with depreciation, but is likely to cost more in repairs and maintenance. Your horse, on the other hand, will probably appreciate in value for a good many years as it steps out in competitions and becomes more worldly wise. In other words, the mileage on your horse generally adds value, as opposed to a car. • Four on the floor, four-wheel-drive. • Four-stage automatic transmission (walk, trot, canter, gallop) with built-in traction control. • Stability control for the toughest terrain. • On-board computer which responds to voice commands. • Runs on biofuel, but major producer of exhaust products. • Fully air-conditioned cab, with ambient temperature control. Developed two million years ago. Still current. Pliohippus, developed seven million years ago but phased out just before current model. Thoroughbred versions have been recorded at over 60kmh. Maximum output of about 14.9 horsepower for short bursts. Capable of a steady 1 horsepower for long periods. A man, by comparison is good for 1.2 horsepower in a burst, but only 0.1 horsepower continuously. Only after long periods of exercise. • Available in four-stage automatic transmission or six-speed manual. • Velour or cloth seating; leather in upmarket versions only. • Rack and pinion, power-assisted steering. • Air-conditioning, with climate control. 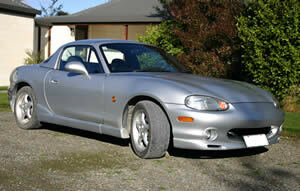 MX5 was created from scratch, but Mazda had long been building its RX7 rotary-engined sports cars. 140 brake horsepower at 6500rpm from four-cylinder 1.8-litre engine model. 1000 to 1050kg, depending on year, engine size, and other specifications. John Travolta may have told us in Grease that cars are automatic, systematic, and hydromatic, but at least horses are 100 per cent biofuel compliant, although they may have trouble meeting today's stringent emission standards. Forget velour upholstery. It's leather all the way with a horse, and the air-conditioning is as nature intended. Even the flashest of cars are only now getting into voice-activated commands, which has been a feature of horses since mankind first decided it was easier to train a horse than build a motor car. The cost of running your car will vary depending upon how much you paid for it, its engine size, and the mileage you do each year. The cost of keeping a horse will also vary widely. Your annual vet bill might range from a few dollars to a sum that would prop up a Pacific Island nation for a year. It's no different with a car - fixing a blown automatic transmission is a very different proposition to changing a faulty spark plug. Your annual feed bill will naturally vary depending upon how many curve balls Mother Nature is throwing that year. That why we've asked about 40 experienced horse owners what they think horse owners should allow for the various costs in keeping a horse. This is an important distinction. We haven't asked what they have spent, or whether they bought new or second hand gear. We asked what they felt an ordinary horse owner should budget for each area. The end result is a little combined wisdom that gives some insight into what your friendly Equus Caballus might be costing you each year. To spice things up, we'll take a nice shiny automobile and see how those numbers stack up by comparison. The figures are from the New Zealand Automobile Association's 2007 assessment of what it costs to drive a car for a year. "Don't ever let your husbands see this," suggested one participant in the exercise. "If you publish this, there will be a whole generation of little girls whose parents will never buy them a pony." So be warned. If you're a man and have just stumbled upon this page, there's a pretty good chance your horse-loving partner might prefer you go outside and mow the lawns. Bust out that chequebook. It's time to spend money! While experienced horse people might buy a green or "problem" horse for a few hundred dollars and, through patient training, turn it into a valuable competition horse, this is not a game any newcomer should be considering. 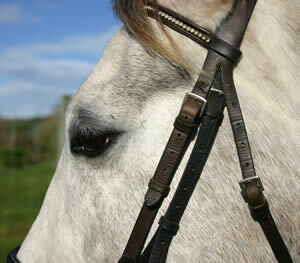 Allow $2000 to $6000 for a starter animal with the kind of experience that should get a new rider safely on the move. A competition rider who replied said her mount cost $50,000. By comparison, the "average" two-litre petrol-powered car in the AA assessment was put at $37,976.67 when new, including registration costs. However, their costs are based on driving it for the third year of its life, which it began with a depreciated book value of $25,442. Makes that starter pony look like a bargain! Many don't do this, but a good number consider the outlay of $300 or so a wise investment. If you're investing in a serious competition horse, and require a full set of x-rays as part of the check, you'll be up for well over $1000. You won't be doing a pre-purchase check on a new car, but the AA would give a second-hand car a good going-over for between $105 and $145. Will you go for a Morris Minor or a Rolls Royce? The range suggested was $250 to $3000. 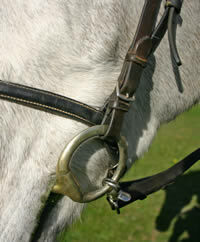 It's essential the saddle fits the horse well, and a cheap saddle may fit just as well as an expensive one. One rider said she started with a new $350 synthetic saddle, which fitted well and did the job. The important thing for newbies is to get good advice. 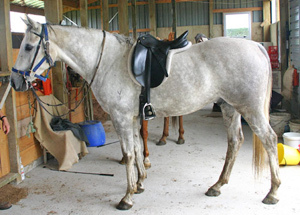 Newcomers will be wise to have the saddle checked on their horse at least once a year: allow $60 to $100. There's plenty more gear to come. New or second hand? Leather or synthetic? If you're savvy, some good second-hand kit could be yours for as little as $100. Alternatively, you could easily spend $1000 and more, at the quality end of the spectrum. Again, you can spend plenty if you wish, but $50 to $100 should get you well under way. Of course, you need not stop at a winter cover. There are summer covers, stable rugs, rain sheets. However, a winter rug will likely be top of the list. New, you'll find plenty from $150 to $350. Some horse owners budget on a new cover every winter; others suggest allowing $50 to $100 a year for replacement and repair. This will vary, depending upon how much showing you do, but $100 would seem to be a representative figure for a year. 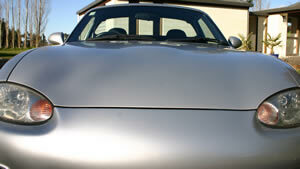 Your car will also need some car shampoo, non-abrasive polish, tyre black and vinyl restorer. Budget about the same! Costs vary widely, depending on a lot factors. The amount of grass available, the quality of the feed, the age of the horse and the amount of work it is doing are only some of the factors. Some horses are better "doers" than others, requiring less feed. Drought and long winters can all jack up the annual costs, as can feed prices if demand is high and availability is low. Hay? Perhaps $200 a year, but some who admitted to being overstocked seemed to be singlehandedly supporting the arable sector. The figure for pre-packaged feeds varied wildly, ranging from a few dollars to $1500 or more a year. Again, it will depend upon how much grass you have, and its quality. However, if your horse is only receiving a top-up when grass is short, or a little feed to deliver his or her other herbs and spices, $200 to $400 a year wouldn't seem out of the ordinary. The annual cost of supplements also showed a wide divergence of opinion, some clearly of the view that their horse require very little, while others invested heavily. The median figure was about $100 a year. Grazing can cost as little as $10 to $15 a week, particularly in the South Island, with $25-$30 a week seemingly not out of the ordinary in the North Island. As one owner points out, agistment can cost you $80 a week, but that would include a lot more than a paddock of grass. Don't kid yourself that you face no grazing costs if you own your own land. Chances are that rates, re-sowing and weed control add up to about the same as you would pay grazing. And let's not forget the interest on that mortgage. Your two-litre car will be stinging you in the pocket in the fuel department, too. The AA bases its assessment on 14,000km of running a year, and petrol at $1.52 a litre, being used at 8.43 litres per 100km. That will set you back a cool $1793.73 a year. We'll call oil an additive for this exercise. The AA allows $55.53 for top-ups. 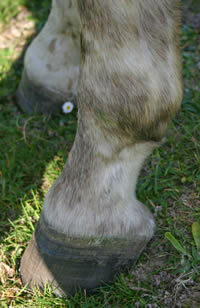 Unless you can do it yourself, you horse will require shoeing or a trim every six weeks or so. Allow $90 to $130 for a full shoeing; $30 to $45 for a trim. Your car also has a cost where the rubber meets the road: The AA has allowed annual tyre costs of $303.51. What depreciation? Your horse will be going up in value every week as it collects ribbons at events, and continues on its unstoppable march to Grand Prix status. Your car, on the other hand, will be worth $3685 less come the end of the year due to depreciation. Long after the AA's car has gone to the giant crusher, your well-mannered retired equine will still be in demand as a bombproof mount for inexperienced riders. Now the cash register is really starting to ring. This is going to hurt. Let's begin with our car. A two-litre vehicle in its third year will cost $712.85 for repairs and maintenance, according to the AA. So, the total cost of fuel, oil, tyres, and repairs and maintenance comes to a tidy $2865.62. Your horse is a little more complicated than that. We've already allowed for the farrier, but there's an annual dental check ($60 to $120), an annual saddle check ($60 to $100), and an occasional visit by a chiropractor or other therapist ($60 to $80 a pop). You'll spend $20 to $30 every six weeks or so for a wormer, and top-ups to your first-aid kit will likely set you back $50 a year. All that, and you haven't even picked up the phone to call a veterinarian. While the Government subsidises most people's doctor's visits and prescriptions, it strangely hasn't occurred to MPs to do the same thing for horses. Thus, the hapless horse owner ends up paying the full noise for everything, from vaccines to antibiotics. A dream year might set you back $150 or so, but a few of those surveyed told of annual vet costs amounting to more than $3000. Looking at the range of opinions offered, allow $500 to $1000 a year, depending upon whether you're an optimist or a pessimist. It would be nice to think the costs ended there, but they don't. There's a helmet, boots, jodhpurs, wet-weather gear, and a raft of other gear you may deem necessary. Lessons will cost you $30 to $60 each, and if you're into showing expect to fork out $10 or more a class. Hiring a tandem-axle braked float can cost you $50 to $80 a day, or if you buy one, expect to pay $4000 to $9000 - and that's just for a second-hand model. If you go down that track, our two-litre AA car won't be up to the job of towing it, so budget for a bigger saloon or a beefy four-wheel-drive. You'll need some portable electric fencing gear ($200 to $300) for break-feeding, and you may have to budget to pay someone to feed and check your horse while you're on holiday. Insurance is another cost, whether it's for your horse, float, or the vehicle to pull it. Another contributor suggested budgeting for a few doctor's visits should you horse deal you a cruel blow or two. Just like cars, there are retail stores devoted to selling every conceivable accessory for you and your horse. The sky is the limit if you're after some bling. Rest easy, horse lovers. The AA's three-year-old is far from finished soaking up the cash. The $2865.62 thus far covers only running costs. The AA has made allowances for registration, a warrant of fitness, insurance, and even factored in $2488 in interest for the money you borrowed to buy it. These fixed costs total $6981 a year, meaning the total running costs for a two-litre car in its third year of life, covering 14,000km a year, is a princely $9846.60. That's 70.3 cents a kilometre. The figure could easily balloon out once you add the fluffy dice, sheepskin seat covers, and a door-shaking sound system, complete with boom box in the boot. How does your horse compare? Getting set up can cost you plenty. These figures would tend to indicate allowing $5000 to $6000 to get everything together. As any horse person will tell you, good learner horses and ponies tend to cost. From there, you're on the winning side. Car owners are battling depreciation, big insurance bills and the fickle price of fuel. Once you've got a horse and gear, you should be able to keep him or her on the go for around $3000 a year if it's a riding hack. Once you start competing and journeying around the show traps, the figure will rise dramatically - kind of like the difference between a family saloon and a rally car. Interestingly, the running costs of our AA car (fuel, oil, tyres, repairs, and maintenance) works out about the same as the running costs of our horse. Once you factor in depreciation, interest, and other fixed costs, the car proves to be far more expensive. So if someone in your life occasionally makes snide remarks about how much your horses cost, your strategy is simple. Point to their car and threaten to trade it in for a bicycle.